After lifting off from the Spaceport, Vega deployed its Sentinel-2B passenger into Sun-synchronous orbit for a mission to monitor land masses and coastal zones around the world. This was the ninth consecutive on-target launch with Vega since its introduction at the Spaceport in February 2012, and marked Arianespace’s third liftoff so far in 2017 – during which the company is targeting up to 12 missions with its launcher family composed of Vega along with the medium-lift Soyuz and heavyweight Ariane 5. 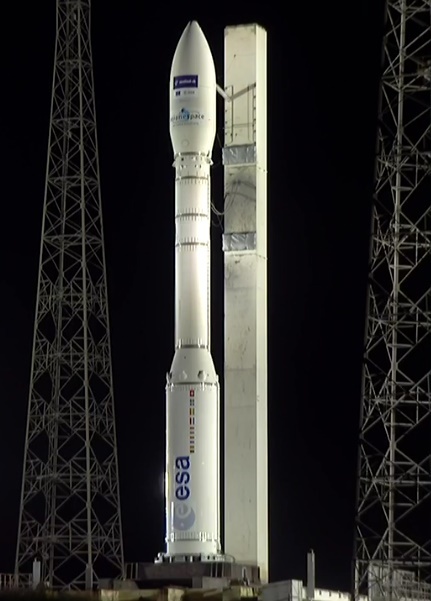 Vega is shown ready for Arianespace Flight VV09, performed from French Guiana. 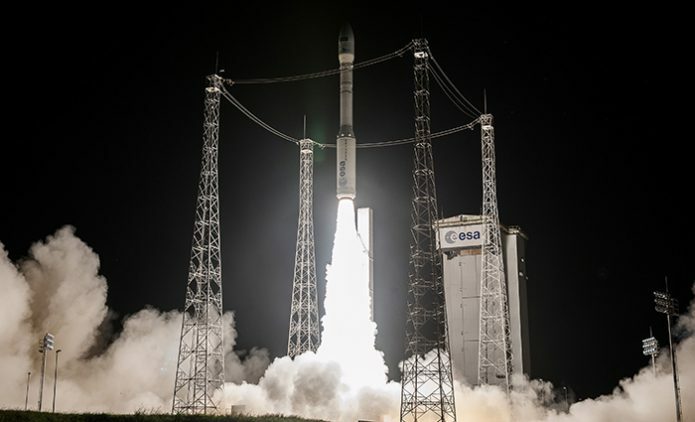 Arianespace’s orbiting of Sentinel-2B – designated Flight VV09 in the company’s launcher family numbering system – was performed on behalf of the European Commission within the scope of a contract with the European Space Agency (ESA). Arianespace will continue its launch services for the European Commission, with eight more of the Galileo satellite-based navigation system spacecraft to orbit – with four planned to be lofted before year-end on an Ariane 5 mission. Arianespace will maintain its sustained mission pace for 2017, with a heavy-lift Ariane 5 launch up next – planned for March 21 with the SGDC dual-use relay satellite for Brazil and Korea’s KOREASAT-7 telecommunications platform. Both spacecraft were built by Thales Alenia Space.